Some of those interesting experiences today. Her: So what are you doing today with the children? Me: I am a storyteller. Her: Oh , good. Something to put them to sleep for a while. That will make them quieter for us. Me: I think you are in for a big surprise, I'm kinda noisy. And one of the children asked (again) after I had done several connected, fun participatory stories:"So when are you finally gonna start reading some books to us?" Hey folks, we've got lots of free TeleCourses this month. Come check it out at http://www.storyellerconference.com . Just finished today's course, great fun. Come learn with us. Next course is Saturday, followed by THREE next week. Learn the Art of Storytelling! Your own pace, privately and FREE OF CHARGE! We’ve developed a free, 36-lesson Ecourse just for you! More than just "tips" to clutter up your Emailbox, we’ll teach you great things for storytelling to adults, teens, tweens and children. Get free storytelling and presentation tips and lessons in your Email. 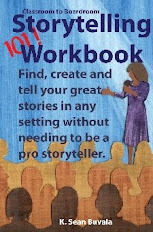 Every 14 days or so, you’ll get another great storytelling tip and lesson from Storyteller.net director and master storyteller K. Sean Buvala. Subscribe today. We never give away, sell or distribute your contact information. Never. You are in control of you subscription. Use the form on this page to get started today. You’ll get your first lesson in a day or so.